Joe Sakic announced his retirement from the NHL on Thursday after a stellar professional career. Joe Sakic has called it quits as an NHL player. The Colorado Avalanche captain announced his retirement on Thursday after a stellar professional career. Fighting back tears at an Avalanche press conference, the quiet superstar formally announced his decision to walk away from the game. "I'm leaving the game of hockey with nothing but great memories," he said. "Hockey has given me everything." The man called Burnaby Joe and Super Joe leaves quite a legacy in his wake. He has two Stanley Cups, a Conn Smythe award (in 1996) and a Hart Trophy (2001). He has also been voted to the All-Star Game 13 times, appearing in 12. The 40-year-old has 1,641 points in 1,378 games over 20 NHL seasons — all with one franchise, as he's been with the Nordiques/Avalanche since he was drafted 15th overall by Quebec in 1987. "I really want to thank the fans in Quebec," he said. "It's an unbelievable place to start your career." 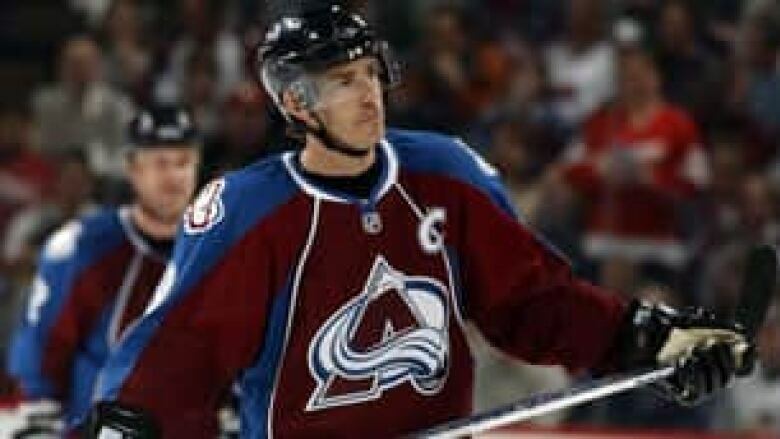 Sakic acted as team captain for the last 16 years and won his two Stanley Cups while in Colorado. "It's been a great place to live, play and raise a family," he said of Denver. When playoff time came around, Sakic thrived. He has the NHL record for most overtime goals, with eight, and is tied for seventh in career playoff points (188). The first Cup win came in Colorado's inaugural season, 1995-96, where he won the Conn Smythe award and scored 18 goals in the playoffs, second in NHL history. "As a kid, you dream of playing in the NHL, winning the Stanley Cup ... to lift that Stanley Cup for the first time was a great thrill," he said. Sakic's second Stanley Cup win exemplified his character. When he was presented with the Cup after the Avs defeated New Jersey in the seventh game of the final, Sakic didn't lift it over his head. Instead, he passed it to veteran Ray Bourque, who had never won the title before. "That class act of yours might go down in history as one of the most memorable moments that united the hockey world," long-time teammate Adam Foote said to Sakic at the press conference. And let's not forget the 2002 Olympics. The sight of Sakic streaking in on Mike Richter to score the fifth Canadian goal, sealing the team's victory over the United States in the gold medal game, has become the defining moment of the tournament. He had four points in that contest and was named the tournament's most valuable player. "Putting on the Canadian jersey, what an honour, what a thrill," he said. "Just an amazing thing I'll always cherish." The Burnaby, B.C., native also won gold in the 1988 world juniors, the 1994 world championship and the 2004 World Cup of Hockey. Sakic hasn't played much in the last two seasons because of injuries but was still one of 46 players invited by Steve Yzerman, executive director of the Canadian men's Olympic team, to attend an orientation camp in Calgary from Aug. 24 to 27. But he won't attend, opting out on a chance to participate in his fourth Olympic Games. "After the year two years ago, I thought for sure I'd be able to make it. It'd be a big dream to play in your hometown," he said. "[But] when I hurt my back, I kind of had an idea ... this probably would be my last year." Maybe the greatest testament to Sakic's character came when Avs president Pierre Lacroix spoke. "My family and I are privileged to know you, and we're convinced we're better people because of you," Lacroix told his long-serving captain, while fighting back tears of his own. "You make everyone around you better." YOUR VIEW: What was Sakic's greatest achievement?